2. A Rockin' Video: I saw the Chatter promo video nearly 4 times at the event, first at the Keynote, and late on at the Expo, and it really grabbed my attention and had every element of a "viral video." Catchy and "edgy" music, an overall sense of urgency, a big "Someday is Now" message, and a visual homerun, with social media stats and the typing of key themes and messages as a visual element throughout. 3. A Great Product: I was very impressed with the capabilities of the Chatter program. Based on a Facebook type interface, you can instantly communicate with your partners or salesteam, and know who is working on what, and when a project has been completed. 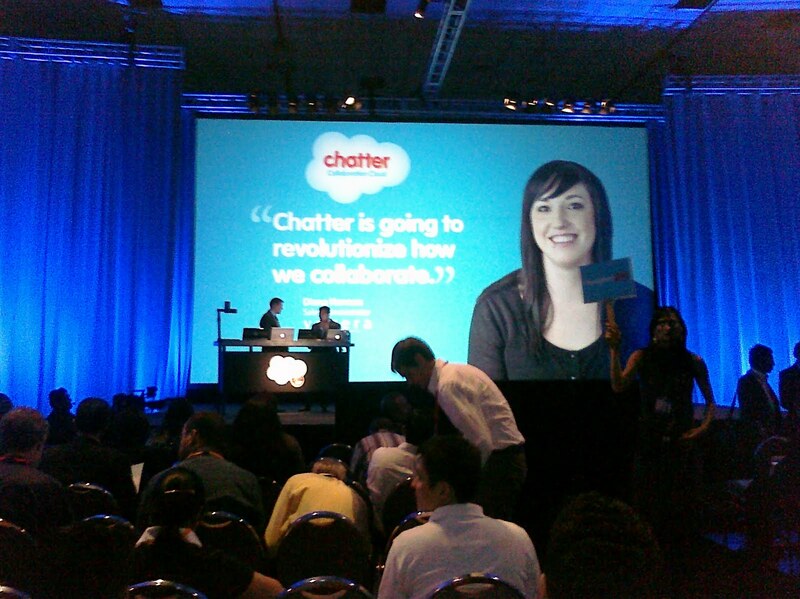 "Salesforce Chatter is the most exciting thing I've worked on in my career," said Benioff. "Delivering Chatter is a seminal moment and one that marks the arrival of Cloud 2." Here's a link to a demo and review from CMS Wire. I was also impressed with the Service Cloud functionality, which created a knowledge database out of customer experiences, so that histories and case files could be readily and efficiently accessed by multiple users next time around. 4. A Swinging Expo: Great demos, bean bag chairs, lattes, and super networking, made this a terrific Expo. Exhibitors included Marketo, automation software for marketing and sales, Docusign (electronic signatures), Deloitte, Accenture, and Birst (reports and dashboards) and many more. OK, he had me at "hello." The San Francisco Business Times named Benioff 2009 Executive of the Year, "for defying the fierce economic downdraft--and taking the lead role in the creation of an industry." In addition to the long list of awards he and Salesforce.com have won since he founded the company out of his apartment in 1999, I loved his energy, passion, and enthusiasm not only for technology, but for humanity. I was also very moved at his donation of $100 million for the UCSF Benioff Children's Hospital at Mission Bay. As a former communications executive for a national nursing organization, I have a place in my heart for this, and I'm looking forward to hearing more. Way to go, Marc. And if you should read this, lunch is on me! Marc Benioff "chats" with Apple's chief iPad designer, Michael Tchao. The Keynote was not your typical speech, but an interactive session with many Chatter Beta partners such as Motorola, Dell, and VMware, talking about their experiences with the product. I liked the Q/A format, and it kept my interest the entire time. 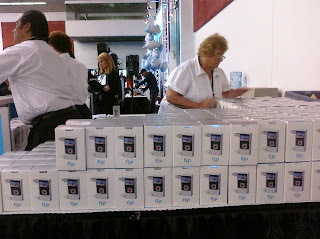 Having the new Flip HD cameras for attendees (complete with Salesforce.com logo) was another smart move. 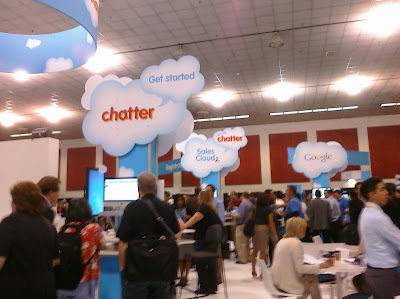 The Expo was impressive, complete with cloud balloons, a demo area with bean bag chairs to view the software, a cafe station, a Chatter Zone, Hackathon, and 8 Salesforce demo stations. Marc Benioff gives a brief overview of Salesforce.com and makes an exciting philanthropy announcement with Susan Desmon-Hellmann, Chancellor of UCSF. Marc then presents Cloud 2, a new generation of enterprise application built for collaboration and inspired by consumer applications such as Facebook. "Speaking at recent web business models conference in New York, media entrepreneur (and former colleague) Larry Kramer reminisced about his start-up's huge customer breakthrough moment. When his firm announced "instant news updates" over pager networks, over a million people signed up in a matter of days. Unfortunately, Kramer recalled, the pager networks his company used were so limited that many of those "instant" alerts took more than 20 minutes to deliver. Not good. His team worked feverishly to rearchitect its software and systems to meet the demand. The service proved a huge success and added millions to the company's value. 'Nowadays," he concluded in a throwaway line, "you'd just use Twitter.'" 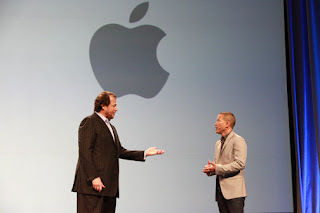 "As you undoubtedly have heard, salesforce.com acquired Jigsaw. Its intention to purchase the company was announced April 21 (the most intense, surreal day of my life) and since then I have refrained from posting to Garth’s World as the two companies worked out what communications from the combined company need to look like while I undertook a search for the best beaches in the Carolinas ☺."